In the last 15 years, the number of UK dairy farmers has fallen from 25,000 to under 10,000. Farmers also face the threat of cheaper imported milk and the export market shrinking. It’s no wonder they are up in arms. There were many protests during this summer, including the Milk Trolley Challenge which originated down the road in Yate, when farmers emptied the shelves of milk in Morrisons supermarket. Here at Uley Community Stores, our milk supplier is Cotteswold Dairy, an independent, family-owned business based in Tewkesbury. They have many industry accreditations, including the Red Tractor. Around 50 farmers are contracted to supply them milk, based within a 30 mile radius – a 15 mile radius for their organic milk. It is Cotteswold’s policy to pay their farmers a premium over and above that which other dairies pay. Many consumers have said they are willing to pay more for milk, implying supermarkets need not use it as a loss leader simply to get shoppers through the door. While our prices are higher than you’ll find at the supermarket we believe in paying a fair price for our milk stock. 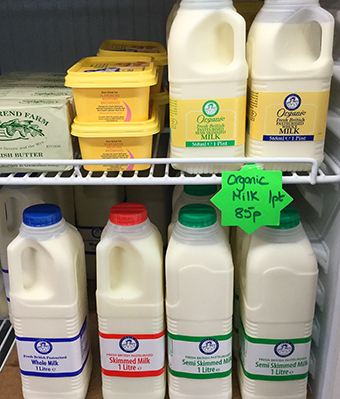 We also hope you enjoy our new stock of Cotteswold’s organic milk now available at UCS.